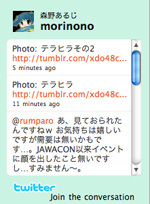 Posted on 2009年11月25日 by morino. This entry was posted in update and tagged drawtwit, tumblr, twitter, 更新情報. Bookmark the permalink.